This is the total number of profanity incidents in this 273 page book. 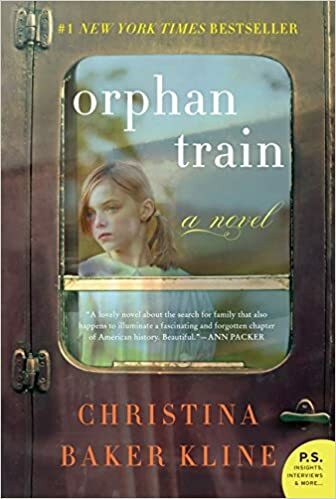 The #1 New York Times Bestseller Christina Baker Kline’s Orphan Train is an unforgettable story of friendship and second chances that highlights a little-known but historically significant movement in America’s past—and it includes a special PS section for book clubs featuring insights, interviews, and more. Penobscot Indian Molly Ayer is close to “aging out” out of the foster care system. A community service position helping an elderly woman clean out her home is the only thing keeping Molly out of juvie and worse... As she helps Vivian sort through her possessions and memories, Molly learns that she and Vivian aren’t as different as they seem to be. A young Irish immigrant orphaned in New York City, Vivian was put on a train to the Midwest with hundreds of other children whose destinies would be determined by luck and chance. Molly discovers that she has the power to help Vivian find answers to mysteries that have haunted her for her entire life—answers that will ultimately free them both. Rich in detail and epic in scope, Orphan Train is a powerful novel of upheaval and resilience, of unexpected friendship, and of the secrets we carry that keep us from finding out who we are.